Jussi Jokinen is joining the Edmonton Oilers. The team announced on Friday that they had signed the veteran Finnish forward to a one-year deal. Jokinen, 34, was bought out by the Florida Panthers late last month. 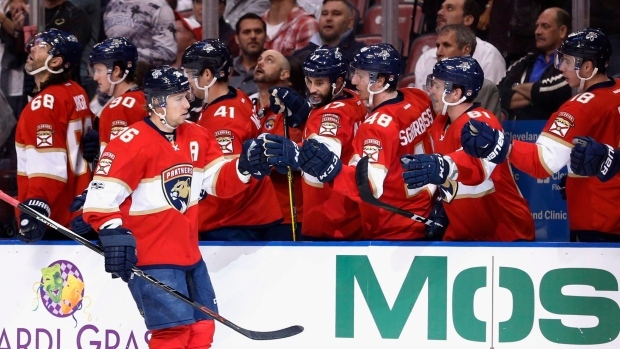 A native of Kalajoki, Finland, Jokinen is heading into his 13th National Hockey League season. Jokinen appeared in 69 games for the Panthers last year, scoring 11 goals and adding 17 assists. His best year offensively came in 2009-2010 when he scored 30 goals and notched 35 assists as a member of the Carolina Hurricanes. Originally taken in the sixth round of the 2001 NHL Entry Draft by Dallas, Jokinen has appeared in 891 career NHL games with the Stars, Tampa Bay Lightning, Hurricanes, Pittsburgh Penguins and Panthers. For his career, Jokinen has 186 goals and 360 assists. Internationally, Jokinen has represented Finland on numerous occasions, including the 2006 and 2014 Winter Olympics, medalling both times with a silver in Torino and a bronze in Sochi.